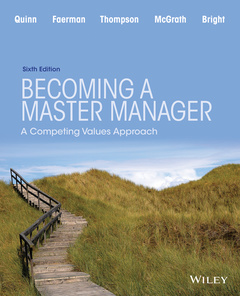 Becoming a Master Manager Quinn Robert E., Bright David, Faerman Sue R., Thompson Michael P., McGrath Michael R.
Auteurs : Quinn Robert E., Bright David, Faerman Sue R., Thompson Michael P., McGrath Michael R.
Becoming a Master Manager is appropriate for management and organizational behavior courses that emphasize critical management skills that yield sound organizational results. Developed from both theory and empirical evidence, the text provides a compelling case for why managerial and leadership competencies are essential for employee engagement, effective communication, and sustainable organizational success. The competing values framework offers future managers a foundation for analyzing, understanding and executing the behavior that will achieve positive performance, productivity and profitability. Course is related to strategic management, business strategy and policy and/or sustainable business. Generally Jr/Sr level elective course. Look for Intro to Sustainable Business, Business Ethics, Social Entrep, Strategic Issues in Mgmt, Environmental & Public Policy courses. RAPIDLY growing course area–– could also be combined with other courses in the business curriculum (custom opportunity).